WASHINGTON (CNN) -- Increased awareness of the details of a possible compromise health care bill is boosting the comfort level of both Democrats and Republicans, a key Democratic senator said Monday. 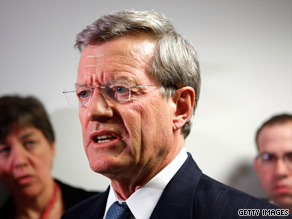 Sen. Max Baucus will reveal his compromise health care reform plan this week. "As senators on and off the committee, [including] Republicans, begin to know more about all of this, their comfort level is starting to come up a bit," Senate Finance Committee Chairman Max Baucus said. "I do believe that in the end we will have some significant bipartisan support." Baucus, D-Montana, heads a bipartisan group of negotiators at the center of the Senate's health care talks. Members of the "Gang of Six" -- a group of three Democratic and three Republican members of the Senate Finance Committee -- are realizing "there's much to agree on," Baucus said. The six negotiators met twice on Monday, including a private session of just the senators without their aides, Baucus said. "I pulled everybody out of the conference room so we could go in my personal office and speak -- just the six of us, for about a half hour, 45 minutes," Baucus said, chuckling as he described telling his colleagues: "Getting down to the bottom line, OK, where is everybody here? What's going on here? When are we going to get a deal here?" Baucus called the session "fruitful," saying, "I think all six really do want agreement." Another of the Finance Committee negotiators, Democratic Sen. Kent Conrad of North Dakota, said the afternoon meeting also considered a provision to specifically prohibit any provisions in the health care proposal from funding abortion. He said existing law that would apply to a health care bill prohibits federal funding of abortion, but added that the Senate negotiators want the bill to eliminate any doubt on the issue. Baucus said he intends to unveil a compromise plan this week, with the full Finance Committee set to begin debating the proposal next week. The Finance Committee is the last of five congressional committees that needs to approve health care legislation before it can be taken up by both the full Senate and the full House of Representatives. Baucus said the Gang of Six had discussed several issues in a meeting Monday morning, including medical malpractice, ensuring a denial of benefits to illegal immigrants and expanding federal support for Medicaid. He said the group was working toward meeting the widely shared goal of reducing the rate of growth of health care spending. The Finance Committee bill as currently drafted would cost roughly $880 billion over 10 years and be fully funded, he added. It would not add to the federal deficit, he said. Conrad added he was "confident we're bending the cost curve in the right way." Iowa GOP Sen. Charles Grassley, also part of the negotiations, said he wanted to see the overall price lowered in light of skyrocketing federal budget deficits. He indicated that there were "five to six unresolved issues" but expressed some optimism that they could be overcome. Last week, President Obama delivered a speech to Congress outlining a proposal similar to the measure being negotiated by the Gang of Six. On Sunday, Conrad and South Carolina GOP Sen. Lindsey Graham said that any chance for a successful compromise will hinge on the outcome of the Finance Committee's negotiations. They both declared the more liberal House version of health care legislation moot. Conrad has proposed creating nonprofit health insurance cooperatives as an alternative to the government-funded public health insurance option included in legislation favored by the House Democratic leadership. Republicans unanimously oppose the public option as an unfair competitor that would drive private insurers out of the market, which they say would bring a government takeover of health care. Democratic supporters reject that claim as misinformation, saying a nonprofit public option would be one choice for consumers who also could sign up for private coverage. Obama, a supporter of the public option, cited the idea of cooperatives as a possible middle-ground in his speech to Congress. One senior Democratic lawmaker, however, promised Sunday that the Senate's health care bill would include a public option that would have support from "some" Republicans. "The bill -- mark my word, I'm the chairman -- is going to have a strong public option," said Sen. Tom Harkin, D-Iowa, who recently filled the late Sen. Ted Kennedy's seat as chairman of the Health, Education, Labor and Pensions Committee. Harkin made his remarks while speaking to a supportive crowd at his annual Steak Fry fundraiser for Iowa Democrats.